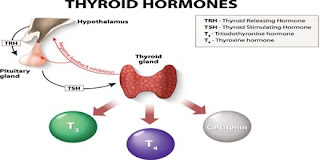 What can go wrong with my thyroid?Hypothyroidism (underactive thyroid) - not enough thyroxine is produced for the body’s needs.Hyperthyroidism (overactive thyroid) - too much thyroxine is produced for the body’s needs.Hypothyroidism is the most common disorder. 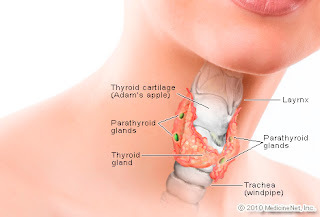 What are the most common symptoms of the most common thyroid disorders that I might experience? 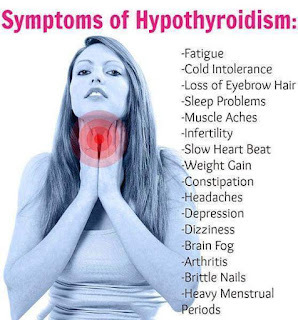 Hypothyroidism: tiredness, feeling cold, weight gain, poor concentration, depression. The posterior lobe produces the following hormones, which are not regulated by the hypothalamus: Antidiuretic hormone (vasopressin): Controls water loss by the kidneysOxytocin: Contracts the uterus during childbirth and stimulates milk production The hormones secreted by the posterior pituitary are actually produced in the brain and carried to the pituitary gland through nerves. They are stored in the pituitary gland. 2... 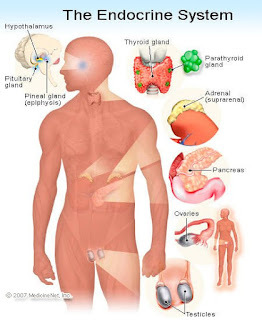 The major glands of endocrine system are the hypothalamus, pituitary, thyroid, parathyroids, adrenals, pineal body, and the reproductive organs (ovaries and testes). The pancreas is also a part of this system; it has a role in hormone production as well as in digestion. Many people across the Globe asked me to explain in details about IMPOTENCE. Many people are suffering from this problem. Let us discuss each and every. 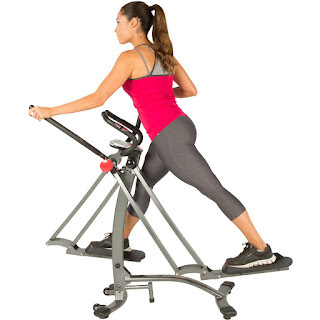 Be sure to wear loose fitting, comfortable clothes, as well as, a good supportive bra.Choose well-fitting shoes that are designed for the type of exercise you are doing.Exercise on a flat, level surface to prevent injury.Eat enough healthy calories to meet the needs of your pregnancy, as well as, your exercise program.Finish eating at least one hour before exercising, Don't eat oily or heavy foodDrink plenty of water before, during and after your workout.After doing floor exercises, get up slowly and gradually to prevent dizziness. 1..... You should take proper care to choose exercise which will not harm to you or your child. Helps reduce backaches, constipation, bloating, and swellingMay help prevent, or treat, gestational diabetesIncrease your energy Improves your moodImproves your posturePromotes muscle tone, strength, and enduranceHelps you sleep betterRegular activity also helps keep you fit during pregnancy and may improve your ability to cope with labor. This will make it easier for you to get back in shape after your baby is born. Exercising for 30 minutes on most, or all, days can benefit your health during pregnancy. Exercising for just 20 minutes, 3 or 4 days a week, is still beneficial, as well. The important thing is to be active and get your blood flowing. To have success in completing exercises during pregnancy, it is a good idea to plan the days and times during the week when you will exercise. As shown in the photo above, prenatal yoga is a great, low impact exercise that can be highly beneficial for pregnant women. Being in the healthy weight range reduces the risk of infertility and improves the chance of conceiving spontaneously and with assisted reproductive technology (ART). Exercise is a key component of managing weight. Here is what you need to know about the benefits of exercise for fertility, quality of life and emotional wellbeing. vaginal bleeding like a menstrual period or spottinglower abdominal pain or crampsdiscomfort or engorgement in the breasts While pregnancy hormones might last in the blood for a couple months after a miscarriage, you should start having normal periods again in three to six weeks. You can resume your normal activities as soon as you feel ready to do so. Listen to your body. It’s important that you give yourself time to heal physically and emotionally. Not all miscarriages can be prevented, but having a miscarriage doesn’t mean you won’t conceive again in the future. According to the Mayo clinic, only a small number of women have two or more miscarriages. Most women who miscarry have healthy pregnancies later. Some recommendations for a healthy pregnancy include: Avoid alcohol, drugs, and smoking while pregnant.Engage in light regular exercise to improve fetal health.Maintain a healthy weight before and during pregnancy.Avoid infections. Wash your hands thoroughly and stay away from people who are already sick.Limit the amount of caffeine to no more than 150 milligrams per day.Take prenatal vitamins to help ensure that you and your developing fetus get enough nutrients.Eat a healthy, well-balanced diet with lots of fruits and vegetables. Most miscarriages are due to natural and unpreventable causes. However, certain risk factors can increase your chances of having a miscarriage. These include: body traumaradiation exposuredrug usealcohol abuseexcessive caffeine consumptionsmokingprevious miscarriagebeing underweight or overweightchronic, uncontrolled conditions, like diabetes Being at an older age can also affect your risk for miscarriages. AgeRisk of having a miscarriageunder 30 years of age1 in 1035 to 39 years of age2 in 10over 45 years of agemore than half Having one miscarriage doesn’t increase your risk for having other miscarriages. Only one in 100 women experience three or more miscarriages in a row. Over 60 percent of these women also go on to carry a baby to full-term.